Thanks to innovations in industrial productivity and technology, the demand for well-prepared robotics and manufacturing engineers is only increasing. The robotics and manufacturing engineering technology major prepares you to meet the demand for professionals well-versed in advanced manufacturing technologies, which includes robotics, computer-aided design (CAD), computer numerical control (CNC), microprocessor controls, computer-aided manufacturing (CAM), flexible manufacturing systems, assembly automation, and electronics manufacturing. Students in the robotics & manufacturing engineering technology degree acquire skills in a wide variety of disciplines vital to industries seeking to contain costs and improve efficiency. Right now, robotics and manufacturing engineers are needed faster than students can complete degree programs, resulting in outstanding employment opportunities for our graduates. This program's major thrust is on advanced manufacturing, emphasizing robotics, automated manufacturing and computer integrated manufacturing (CIM), with technical concentrations in design and assembly modeling, design for manufacture and assembly, data acquisition and instrumentation, quality control, lean six sigma, manufacturing management, plastics processing, and electronics packaging. The subjects covered in the core curriculum include traditional and non-traditional manufacturing processes, materials technology, computer-aided design, computer-aided manufacturing, controls for manufacturing automation (PLC), microprocessors, robotics, electrical and electronics principles, surface mount electronics packaging fundamentals, quality control, engineering economics, and production and operations management. The uniqueness of this program is in its combination of technical and management courses at the undergraduate level and also its emphasis on project-based hands-on practical education. The robotics and manufacturing engineering technology major is designed with the aid and consultation of professionals in the field and emphasizes computer-integrated manufacturing and production system development. Courses cover traditional and non-traditional manufacturing processes, fundamentals of electronics and microprocessors, computer-aided design and manufacturing, computer numerical control, robotics, materials requirements planning, design for manufacturing and assembly, surface-mount electronics manufacturing and assembly, flexible manufacturing systems, quality control, engineering economics, plastics manufacturing, manufacturing management, and lean manufacturing. The major prepares students for professional employment in the fields of industrial robotics, production systems design, development, and manufacturing. Designed to provide the skills necessary for applying emerging manufacturing technologies, the major develops well-rounded manufacturing engineers who are lifelong learners with the ability to adapt, grow, and succeed in a highly competitive workplace. Cooperative education enhances these skills by allowing students to gain valuable experience working in the manufacturing industry. Cooperative education, or co-op, is an increasingly valuable integrated, co-curricular experience required by many programs in the college. Students gain real-world experience and make life-long professional connections while earning a salary, which may help offset college costs. Engineering technology students are required to complete four co-op blocks. This typically includes one spring, one fall, and two summer terms, alternating periods of full-time study with full-time paid work experience in their career field. In some circumstances, other forms of experiential education, such as study abroad, research, or military service, may be used to fulfill part of the co-op requirement. Each student is assigned a co-op adviser to assist in identifying and applying to co-op opportunities. The manufacturing engineering technology major is accredited by the Engineering Technology Accreditation Commission of ABET, http://www.abet.org. Manufacturing Day provides current students and local guidance counselors with important information about regional automotive, computer, plastics and electronics manufacturing opportunities and the coursework necessary to be successful in these fields. RIT’s three sleek Formula racecars, Baja off-road vehicle, Hot Wheelz hybrid electric Formula car and EVO, the electric motorcycle, all built by RIT students, will be unveiled as part of the Imagine RIT festival on May 6. This course will introduce students to the disciplines in the field of mechanical engineering. Students will be introduced to design and engineering problem solving methods that will be applied to problems. Students will collect data, analyze data, perform design calculations, and solve equations. Project reports are generated through the integration of these tools with word processing and presentation software. The application of software tools to the engineering design process will be emphasized throughout. 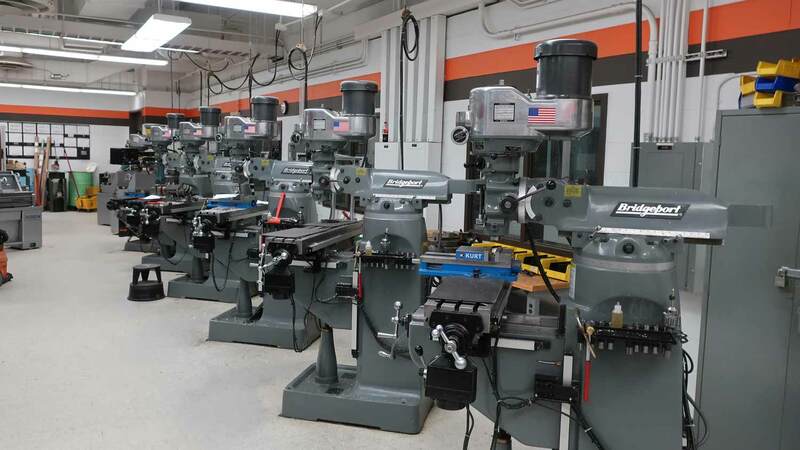 Proficiency with traditional machine shop tools will be demonstrated with an emphasis on safety. Students will demonstrate their abilities to interpret drawings and select the appropriate equipment needed to produce each part. Parts built will be inspected by the student to verify the meeting of part requirements. Students will repair/replace any parts that are found to be out of specifications. Inspection tools will be utilized in the product validation requirement of the course. Topics will be experimentally validated through the creation of mechanical parts that will be assembled into a final product. This course will focus on the understanding and application of manufacturing processes. Students will be challenged to discover and learn how typical piece parts and assemblies are manufactured. Topics include material properties and the following process families: casting, material removal, deformation, consolidation, powder metallurgy, plastics fabrication, EDM, water jet, chemical, LASERS, plasma, and rapid prototyping. This class explores the commonly used engineering metals. Differentiation of materials, with a focus on metals, is made based on an understanding and control of fundamental material properties. This knowledge of properties and materials then informs analysis of which metals are selected for various applications. Corrosion and its mitigation are explored. Materials selection software and internet resources are used. This lab class accompanies MCET-110 Foundations of Materials. An emphasis is placed on determining material, primarily metals, properties though experimentation and references, and analyzing why a particular material was selected for an application based on the materials properties. Differentiation of materials families is made based on properties. A variety of discovery activities are used to explore the world of metals, including labs of various types, materials selection software, and internet resources. This rigorous course is primarily for, but not limited to, engineering students. Topics include an introduction to some basic concepts in chemistry, stoichiometry, First Law of Thermodynamics, thermochemistry, electronic theory of composition and structure, and chemical bonding. The lecture is supported by workshop-style problem sessions. Offered in traditional and online format. This course will cover the process of selecting a best material for a given design application with a focus on polymeric materials. To support this process material families, strengthening mechanisms, and degradation mechanisms and prevention will be studied. The materials selection process will include economic, ecological, and ethical considerations. An emphasis is placed on the interrelationship of structure, process, and properties. This class expands upon concepts presented in MCET-110. This course will consist of laboratory experiences which focus on property characterization of the properties of polymeric materials. This course provides an introduction to the analysis and design of structures and machines. Students learn to calculate stresses and deflections in axially loaded members, beams, shafts, and columns. Topics include statically indeterminate problems, thermal stress, stress concentration, combined stress by superposition, and Mohr’s Circle. Students also gain experience with laboratory equipment, experimental methods, team work, project management, and communications as they complete laboratory and project assignments. Develops the skills to analyze introductory AC and DC circuits and electronics. Topics include Ohm’s Law; current and voltage division; simplification of circuits; reactance and impedance; and operational amplifier applications including current sources, strain gauge amplifiers, differential amplifiers and comparator circuits. Students, upon completion of this course, will be able to use laboratory tools to analyze and troubleshoot AC and DC and basic electronic circuits. They will be able to operate a power supply, multi-meter, function generator, and oscilloscope. This course will focus on academic writing specifically, the arguments presented in different fields and professions about issues of significance. Students will learn about the rhetorical, ethical, emotional, historical and logical elements of persuasion as they relate to written and visual arguments and they will practice making claims, providing evidence, exploring underlying assumptions and anticipating counter-arguments as they relate to different audiences. In addition to argument analyses, students will develop arguments of their own through inquiry-based essays. This course will provide a thorough understanding of the manufacturing automation principles, practices, and system integration. Topics include a thorough coverage of the automation hardware and software, essentials of digital and analog control using Programmable Logic Controllers (PLCs), industry best practices for programming PLCs and the essentials of Human Machine Interface (HMI) for data entry, manipulation, and recording system status. This course will provide a thorough hands-on experience in using Programmable Logic Controllers (PLCs) for manufacturing automation and system integration. Industry best practices for programming PLCs and the essentials of Human Machine Interface (HMI) for data entry, manipulation, and recording system status will be included. Course provides a thorough understanding of the technology, components, equipment, and manufacturing process for through hole technology and surface mount technology electronics manufacturing. Students will develop a strong foundation needed for advanced work in surface mount technology (SMT). The laboratory activities will provide the students an orientation and familiarization of the manufacturing equipment and process parameters for electronics manufacturing including through hole technology and surface mount technology. One semester of experience in a job related to the student's major. Completion of Co-op Orientation required before registering for co-op. Department permission is required. This course is designed to introduce the student to techniques required to maintain and improve quality within manufacturing organizations and the service sector through the use of statistical methodologies. The course covers concepts of quality, quality managements and assurance, product quality, design of quality control chart, statistical process control, and quality improvement through design by considering concept development and implementation. Traditional and modern quality systems will be discussed including the work of such quality gurus like Taguchi, Deming, Juran, and Shewhart. This course provides in depth coverage of engineering economic analysis, which is the financial side of engineering decision making. Students are also taught ethical decision making through an introduction to an engineering professional code of conduct. Project planning/management are introduced to students. Presentation skills are enhanced with an emphasis on presenting to executives. This course is designed to provide the student with knowledge and skills of contemporary theories and practices in operations and supply chain management employed by world class manufacturing organizations. Students are introduced to topics that include forecasting, aggregate planning, inventory management, capacity management, and supply chain management. Integrated with these topics are lean excellence tools VSM, 5S, Kanban, OEE and Standard Work Practices, Cycle Time Analysis. Integrated design for manufacture and assembly manufacturing processes are expanded and applied to the design process. Part concepts will be considered for various manufacturing processes to determine which process will yield the lowest cost part that meets all product functional requirements. Students will learn the DFMA methodology for making decisions to analyze the costs associated with their product concepts. Designs will consider the tooling that is required in product build and will understand the interrelationships between decisions and the cost associated with manufacture and service of the product. At the conclusion of the course students will be able to effectively design parts and assemblies for manufacture, assembly, and service. Costing will be considered at every step of the design process. MFET-580 Production Systems Design and MFET-590 Production Systems Development together form manufacturing engineering technology senior project. Students will gain the fundamentals in designing a production system in MFET-580 in preparation of constructing a fully functioning automated work cell that produces a finished packaged product in MFET-590. Students will study component processes that are utilized in advanced manufacturing systems. MFET-580 Production Systems Design and MFET-590 Production Systems Development together form manufacturing engineering technology senior project. This course is project-based. In MFET-590 students construct a fully functioning automated work cell that produces a finished packaged product. Students will also practice project management, project planning and effective communication while drawing on their past technical skills (e.g. Solid works) to complete the project. Students are tasked to use an integrated design, problem-solving process development, and assembly techniques in the completion of a fully functional automated workcell and product. Process improvement becomes inherent in the integrated activities. Design, final documentation, and demonstration of successful fully functional automated workcell and assembly of a product are required. This course is intended to help students learn to think like systems engineers. This course will provide a thorough understanding of the systems fundamentals, its design, modeling, and integration. Topics include a thorough coverage of systems architecture, conceptualization, modeling, development and management. Students in this course will be taught industry practices for systems engineering and management from concept stage to post implementation stage. System engineering and modeling tools will also be introduced to assist with the conceptualization, development, and implementation of systems. This course presents the philosophy and tools that will enable participants to develop quality strategies and drive process improvements that are linked to and integrated with business plans. Continuous improvement principles are presented, within the six sigma format. The course will help prepare students for six sigma blackbelt certification. Students can receive credit for only one of the following: MFET-730, CQAS-701, or ISEE-682. How to design and analyze experiments, with an emphasis on applications in engineering and the physical sciences. Topics include the role of statistics in scientific experimentation; general principles of design, including randomization, replication, and blocking; replicated and un-replicated two-level factorial designs; two-level fractional-factorial designs; response surface designs. This is an introductory graduate-level survey course on research design/methods and analysis. The course provides a broad overview of the process and practices of research in applied contexts. Content includes principles and techniques of research design, sampling, data collection, and analysis including the nature of evidence, types of research, defining research questions, sampling techniques, data collection, data analysis, issues concerning human subjects and research ethics, and challenges associated with conducting research in real-world contexts. The analysis component of the course provides an understanding of statistical methodology used to collect and interpret data found in research as well as how to read and interpret data collection instruments. Students will rigorously develop their thesis research ideas, conduct literature reviews, identify and plan methodologies, prepare schedules, and gain a clear understanding of the expectations of the faculty and the discipline. Each student will be required to prepare a committee approved thesis research proposal and may begin work on their thesis. Students have an opportunity to participate in regional and national design competitions such as the Society of Automotive Engineers (SAE) BAJA team, SAE Clean Snowmobile Challenge team, Formula SAE Racing, and SAE Formula Electric teams. Students are also encouraged to participate in the student chapters of professional societies such as the Society of Manufacturing Engineers (SME), the Society of Woman Engineers (SWE), the National Society of Black Engineers (NSBE), Society of Hispanic Professional Engineers (SHPE), and Society of Automotive Engineers (SAE). Students who are employed full time may pursue the major on a part-time basis by taking the upper-division portion of the curriculum during day or evening hours. It is recommended that students take one to two courses per semester. Students also may elect certain courses from other engineering technology majors, with department approval.